Ever since I saw Jeanette Madsen at London Fashion Week wearing a pair of teardrop earrings in a bold primary school–style yellow, I've wanted them. Writing a shopping list based on the things you see on the front row can be dangerous for your bank balance, but these are only £13 from Zara. So unsurprisingly they have quickly become a fashion-girl favourite. Zara's new collection is ensuring that we don't move on from last year's big-earring obsession. The new-in section is bursting with graphic earrings in vibrant colours. The stacked colourblock earrings, as worn by ThatsALeaf, look like the sort of accessory sported by art teachers. The key to styling these earrings is to pair them with even more colours and prints, whether that's a head-to-toe yellow outfit or a jazzy polka-dot print. Keep scrolling to see the best earrings in Zara right now. 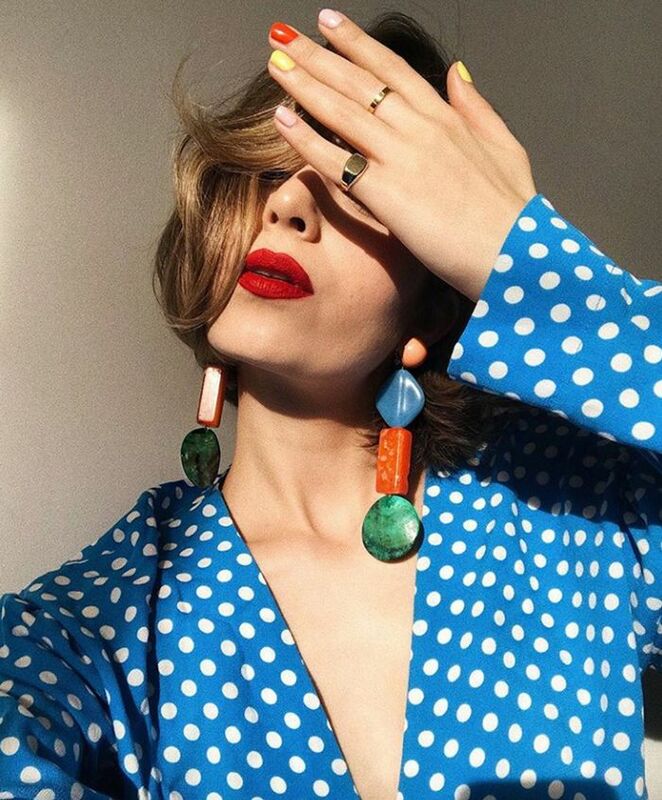 Style Notes: You might be tempted to pair such bold earrings with something simple, but we're into the clash with polka dots. Style Notes: During London Fashion Week, Jeanette Madsen paired her yellow earrings with a yellow jumper. These have been a street style favourite. At this price, you can stock up. We love the green speckly version too. Pair with a simple tee and you're good to go.